PORK shank OSSO BUCO braised to perfection. A flavourful, melt-in-your-mouth bite every time. Before a stunning hit of SPRING launches me towards lighter meals... I decided it was high time to share one of my tantalizing meat dishes. Growing up, this classic dish was one of our favourites. Mom always had us running to the table after having the Osso Buco aroma wafting through our home. It wasn’t long before we would be asking for an extra helping. Like most, Mom always made her version with veal shanks. It’s only been very recently that she has steered towards using a slightly inexpensive cut of meat. 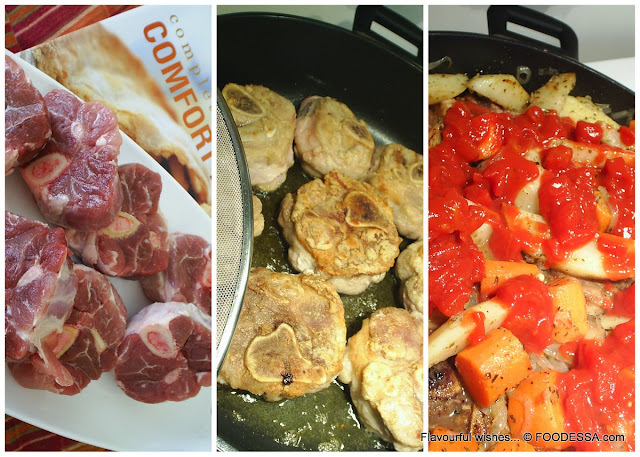 putting the Classic Osso Buco on a budget. When was the last time you bought organic, milk-fed veal? The last time I splurged on this pricey meat was during an Easter feast at our place. The rest of the grocery bill matched the small fortune splurged on this dish. I had to experiment with less expensive, yet, mindful meat choices. Pork shanks to the rescue. Pork, as does veal, has a fairly high proportion of meat to bone ratio. It also has just enough fatty tissue to add that desired flavour. Be very careful not to be distracted when selecting a package of what you may think is FRESH meat. On several occasions, I noticed very small printed labels stating that the pork was pre-frozen. Place it into the freezer for at least 2 or more hours before putting it back into the fridge to thaw. I take this precaution to wipe out any worry I would have concerning possible bacteria proliferation. Your choice on what is best for you and your loved ones. We, have had to make decisions on different eating habits and therefore consume meat less often. encouraged the cost savings without the sacrificing one of our favourite dishes. We also increase the side vegetables to replace some of the extra meat we were accustomed to eating. Lots of caramelized onions, carrots, plum tomatoes and potatoes go a long way to satisfy our hunger. not purposely of course. LOL. This recipe with pork shanks is just as "fall off the bone" tender as the veal shank version. The only slight difference was a diminished amount of succulent bone marrow. By now, I'm sure, many of you have eaten an Osso Buco dish. I do hope it was a wonderful culinary experience. follow me to my signature thrifty dish. Preparation time and cooking takes a little more than 3 hrs.
. 1/2 tsp. (2.5ml) each from dried herbs: basil, marjoram, oregano, rosemary, sage, tarragon.
. The classic Veal shank of course could be used.
. Beef and Lamb shanks could also be used, however, keep in mind that it will not result in the incredible "fall off the bone" tenderness you expect from an 'Osso Buco' dish. A- STOVETOP METHOD: Keep the pan on the stovetop on LOW-MEDIUM heat (simmer) without ever lifting the lid another 2 Hrs. after cooking the main recipe. B- OVEN METHOD: Pre-heat oven to 325F/160C/Gas3 and position rack on 2nd level from bottom. Place a baking pan into the oven by then placing the pan on top. Cook for 2-1/2 hours. 1. Take each (patted dry) pork shank and dredge both sides into the flour (I use a plastic bag). Shake off excess and set aside on a clean platter. 2. In a large, deep pan or in a large Dutch oven pot, heat the oils and the butter on MEDIUM-HIGH heat. Gradually add and distribute the pork shanks evenly by covering the bottom of the pan. Cover with a wire screen to avoid grease splatter. 3. Once red liquid comes gushing out of the meat, it's the go-ahead to turn each piece over for browning the other side. This whole process should not take more than 10 minutes. Take the meat out of the pan and place it temporarily in a clean plate with an aluminum foil covering it. 4. In the same pan, immediately start to sauté the onions. Once the onions have lightly caramelized, add the chosen vegetables. Sprinkle in half the amount of salt and garlic powder. ...Meanwhile, pre-heat the oven to 325F/160C/Gas3. 5. Place the pork shanks back into the pan by snuggling them in a part of the way. Add the remaining spices. Once the heat has picked back up, pour the chosen spirit(s). Now, add the orange concentrate as well as the tomatoes. Afterwards, add and finish off by pouring the broth over top. 6. Cover the pork with the pan's lid. Place a baking pan into the oven by then placing the pan on top. Cook for 2-1/2 hours. After which, the meat should probably be slightly detached from its bone.
. Carefully remove the pork shanks as to not break them up. Add the combined vegetables to each dish. Pour a little sauce over top.
. You may also want to make another dish with this meat and forgo using the carrots and potatoes at this time. Therefore, Osso Buco can be served alongside a plate of pasta or on a bed of rice such as the popular 'Risotto alla Milanese'. A creamy, mashed potato or polenta is also a very popular accompaniment. Note: For those who insist on serving it with the classic 'Gremolata'...here's a very easy recipe for this garnish: A handful of finely chopped flat parsley, a small minced garlic clove, finely grated zest from a medium lemon, a little lemon juice. Mix it all and there you have it. Sprinkle over the meat dish. Several conscious efforts have been slowly taking place in my culinary life-style habits. Although, it may not always be easy, I do find these little victories very rewarding indeed. Have you made or contemplated changes in contributing to better earth-health consciousness? Have any of these changes enhanced your pocket-book or at least improved your health status? As for myself...the circle of complete comfort food has once more been proudly achieved. Buon appetito!